The Chinese kindergarten children giggled as they worked to solve puzzles assigned by their new teaching assistant: a roundish, short educator with a screen for a face. Just under 60 centimetres (two feet) high, the autonomous robot named Keeko has been a hit in several kindergartens, telling stories and challenging children with logic problems. Round and white with a tubby body, the armless robot zips around on tiny wheels, its inbuilt cameras doubling up both as navigational sensors and a front-facing camera allowing users to record video journals. In China, robots are being developed to deliver groceries, provide companionship to the elderly, dispense legal advice and now, as Keeko’s creators hope, join the ranks of educators. At the Yiswind Institute of Multicultural Education on the outskirts of Beijing, the children have been tasked to help a prince find his way through a desert — by putting together square mats that represent a path taken by the robot — part storytelling and part problem-solving. Each time they get an answer right, the device reacts with delight, its face flashing heart-shaped eyes. 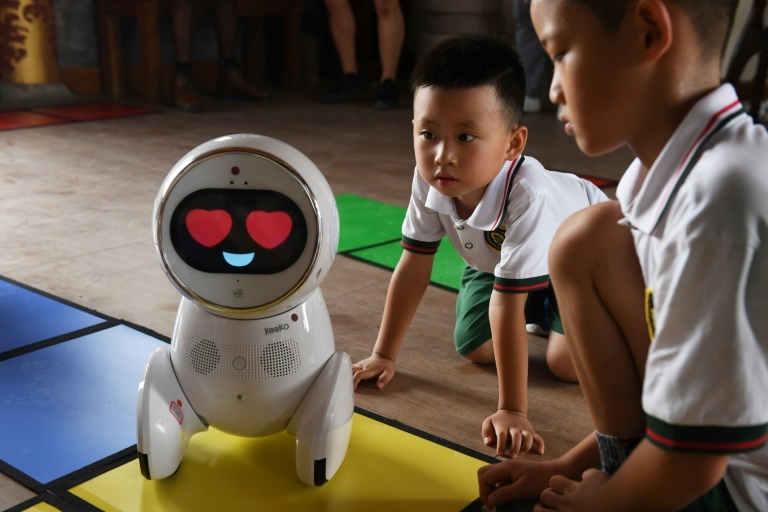 “Education today is no longer a one-way street, where the teacher teaches and students just learn,” said Candy Xiong, a teacher trained in early childhood education who now works with Keeko Robot Xiamen Technology as a trainer. “When children see Keeko with its round head and body, it looks adorable and children love it. So when they see Keeko, they almost instantly take to it,” she added. Keeko robots have entered more than 600 kindergartens across the country with its makers hoping to expand into Greater China and Southeast Asia. Beijing has invested money and manpower in developing artificial intelligence as part of its “Made in China 2025” plan, with a Chinese firm last year unveiling the country’s first human-like robot that can hold simple conversations and make facial expressions. According to the International Federation of Robots, China has the world’s top industrial robot stock, with some 340,000 units in factories across the country engaged in manufacturing and the automotive industry. The service robot market — which includes devices ranging from specialised medical equipment to automated vacuum cleaners –- is estimated to be worth $1.32 billion last year. It is expected to grow to $4.9 billion by 2022, said market research firm Research In China. Last week, Beijing hosted the World Robot Conference, featuring machines that can diagnose diseases, play badminton and wow audiences with their musical skills. Last year, a group of monks in Beijing created a two-foot-high robot monk dispensing mantras and advice to attaining nirvana. The iPal — a companion of sorts for children — is the latest humanoid robot to be marketed for family use, following in the footsteps of the diminutive, wisecracking “Pepper” companion released by Japan’s SoftBank in 2015. But Xie Yi, principal of the kindergarten where Keeko has been put on trial, believes that it will be a long while before robots can completely replace humans in the classroom. “To teach you must be able to interact, have a human touch, eye contact and facial expressions. These are the things that make an education,” Xie said. She said the Keeko robots, which cost about 10,000 yuan ($1,500), or about the monthly salary of a kindergarten teacher, may have some advantages over a flesh-and-blood educator.